Assessing body condition is an important step in the overall evaluation of a companion animal's nutritional well-being. 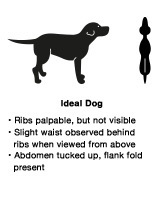 Particularly in cases where the dog appears to be obese or underweight, it is important to evaluate total health of the dog before a proper nutritional management program is selected. 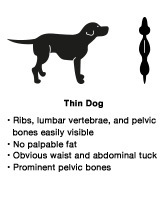 The following body condition charts help explain body condition terms.